Now, assuming you don't care about that, you just want the motor to not influence the rest of the circuit: the reason you need to connect the grounds is because when the arduino sends a 5V signal, the driver has to understand that it's a 5V signal. It does so by comparing the signal's voltage to its own reference (GND pin). If the grounds are disconnected, the voltage the driver "sees" will be random, since the driver's ground could be, say, 2V above the arduino's ground, completely messing up your logic. The problem is that your motor is probably making a lot of current flow through this ground path, making some voltage drops appear on it. Voltage drops in the ground path happen in every circuit. The problem is when two components are attached to the ground path in different points, causing them to "see" different grounds, and so they disagree on the logic levels. 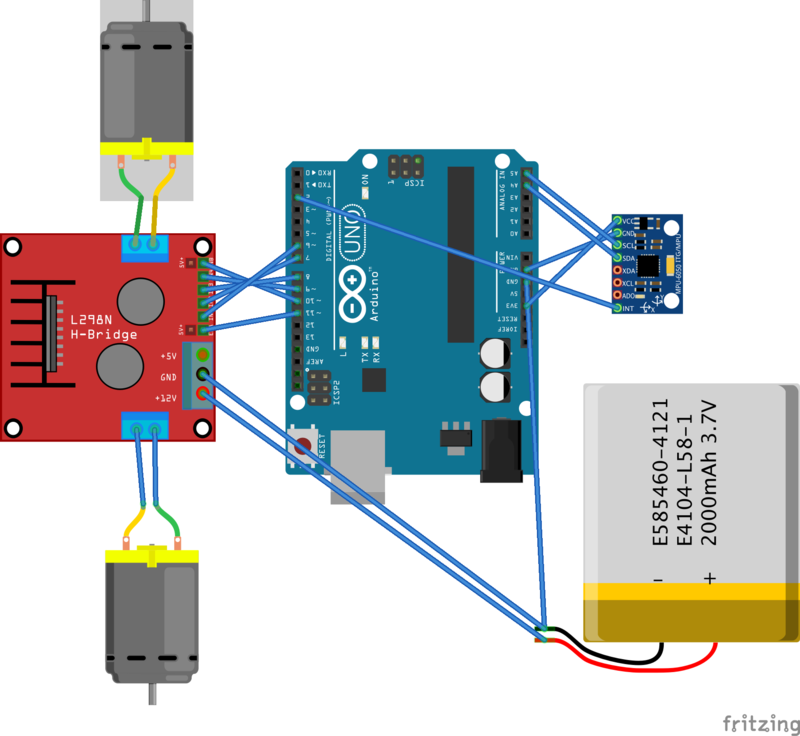 This is probably your problem: the inertial unit and the arduino see very different grounds when the motor produces a current pulse, and that's enough to make the logic mess up. Add a big capacitor between the driver's +12V and GND terminals to supress pulses. Assuming Add the 330R resistors I mentioned earlier: they should make the '1' logic level signal more robust (because of the arduino's I2C pull-up. See this). Also, safer. I'm assuming a pull-up resistor on the MPU6050's board. Add a resistor between grounds so that the rise in one of them does not affect the other so much. Problem is, the driver uses the other ground, so it could stop understanding the arduino's control signals. Connect the battery's GND to the USB's GND, so both the arduino and the MPU are not so far apart in the ground path. Bad dangerous idea, you'll fry your USB, don't do it at all. Use the damn logic shift circuit. Use an optoisolated driver. This way, you don't need to connect the grounds. @RakshithGb Fixed his problem, but He ask me a circuit example using SI8660. Because of confidentiality issues, I can't post the exact circuit, but this sketch shows an application of the digital isolator. It's only a simplified version. The history of this circuit is that it has a UI and because of security issues is not recommended that's interface has some physical connection (grounds or power supplies) with the power part (half-bridge). To avoid any damage to users. Then, We think about it. 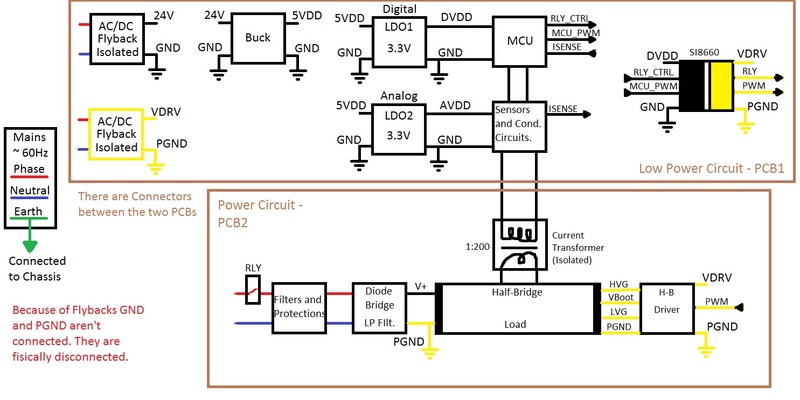 What's the best way to isolate low power circuit (control circuit) from power circuit? Another AC/DC isolated power supply was used as solution. Check out the sketch: PGND and GND are not physically connected. The current transformer and the safety relay are already isolated by nature. However, the relay signal is applied through SI8660 because it converts the signal in a range between 0 and VDRV (proper to relay). Not the answer you're looking for? Browse other questions tagged grounding or ask your own question. The difference between technical ground and safety ground?